When the Strawn High School Greyhounds go to the Texas State High School Football Championship next Wednesday, the 6-man 1-A Division 2 team will make history. Kicker K-Lani Nava, a senior, will be the first girl to play in the championship. "I try to put my nerves behind me just by lying ot myself like it's just another game," Nava said during practice. "Even though this is everything." Nava is a petite 5-foot-3, 140 pounds. She switched from playing soccer to football as a freshman. "No one really thought I could do it at first," said Nava. "I'm not into the whole, 'Oh, she's a girl.' I'm a player, just like they are." "This was not the football I was wanting her to play, but here we are and we're pretty excited about this year," said Christie Nava, K-Lani's mother. "I'm one proud mama bear!" Placekicking in six-man football is extraordinarily difficult. There only four people up front to protect a kicker and opposing defensive ends having a much shorter distance to cover to block kicks. So difficult is this task in six-man, that field goals are worth four points and PAT kicks are worth two. Yet Nava connected on 63 of 74 PAT attempts this year (a very high percentage for six-man kickers), giving her 126 of her team's points in her team's first nine games. She routinely hits from 40 yards during practices. "Her getting hit worried me when she first came out for football as a freshman and I didn't think she'd ever kick for the varsity, to be honest," said coach Dewaine Lee. "But she started kicking really well and she and her mom started taking it really seriously." "She started going to kicking camps. She's got her own kicking coach. They really spent the time and money, so I knew right then that they were definitely bought into it. Then she started getting better and better and better. We've got a good season going and extra points are really important in six-man because they're worth two points. But I trust her 100 percent." 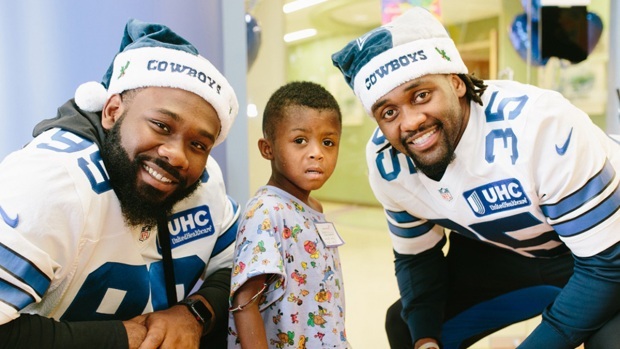 Cowboys Players, Cheerleaders Visit Kids at Children's Hosp. "In the beginning it was negative," said Nava, who plans on attending Texas A&M University at Galveston to study marine biology. "They just thought a girl couldn't do it. "But I proved myself to them, they started warming up to me and by the end of my freshman year, I was good." It hasn't been uncommon for opposing players to try intimidating her. And yes, she's been hit. In fact, she's been flattened. "It was in my first game ever and my first kick," recalled Nava, who first developed her kicking skills playing club soccer. "We missed a snap and this guy just came up and knocked me (flat)." "I honestly got up laughing," she said. "I thought it was funny. Everyone else freaked out but I thought it was funny because it's part of the game." That enthusiasm extends beyond the football field. Nava also serves as the starting center for girls' basketball team (despite being its third-shortest player) and also participates in tennis and track. Her prowess in the classroom, however, may eventually trump everything else. Already taking college-level courses, the honor student will enter Texas A&M Galveston as a sophomore and could potentially earn her college degree in marine biology by the time she's 20. Her eventual career goal isn't exactly common in land-locked Palo Pinto County, Texas. Strawn is about 70 miles west of Fort Worth. "I want to get my Ph.D. in marine biology in the study of sea turtles," Nava said. "I just have a special connection with them." "The fact that they're endangered makes me want to try to find ways to help them," she said. "I honestly didn't think I'd make it this far," said Nava, who will be in contention for All-Big Country honors if her numbers hold up. "In my freshman year, I thought the guys would just pick me apart." "But I just became mentally strong with it and I can honestly say than anyone can do anything now, especially with a girl playing football. And I've honestly enjoyed it. ... I just think everyone should know that anything is possible," she said.